What has the wingspan of a 747, weighs no more than a small car and can fly day and night without ever refueling? 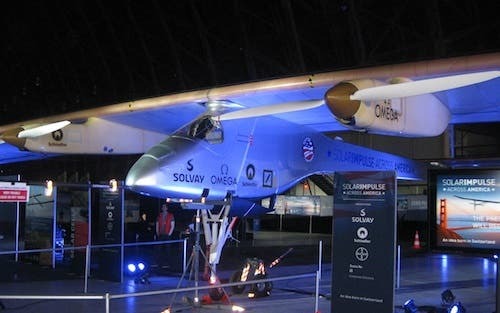 I learned the answer to those questions yesterday at a press conference held at Moffett Field outside San Francisco for the Solar Impulse solar-powered airplane. In 2010, Solar Impulse set a world record with the first solar-powered night flight, staying aloft over 26 hours. During daylight, Solar Impulse was able to fully charge its batteries while powering its four engines. By morning, 40 percent of the available charge remained in the batteries as the cycle of recharge began in the morning light. Solar Impulse could have continued on, the limitation was the pilot, not the plane. With several milestones crossed in Europe and Africa, Solar Impulse was disassembled and brought to America where it now sits in an enormous hanger at Moffett Field, ready for a journey coast-to-coast across America using not a single drop of fuel. 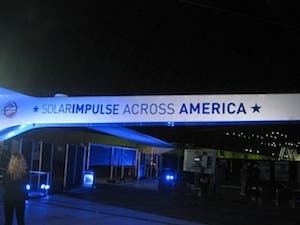 Solar Impulse will leave Moffett Field outside San Francisco in early May and make stops in Phoenix, Dallas, Atlanta, and Washington, DC, ending its historic journey at New York’s JFK airport in early July. The top of the wings are constructed with 11,548 solar cells only 135 microns thick (the thickness of a human hair) and producing an efficiency of 22.7%. Made by Silicon Valley solar company SunPower, the cells are covered with a thin, UV-resistent, and waterproof copolymer film with potential application in electric cars. The lower part of the wings are built with ultra-light fabric and the wing spar is made of fiber honeycomb sandwich panels. The fuselage utilizes innovation and advances in lightweight carbon fiber sheets. Weighing only 0.8 oz/11 square feet, the sheets are three times lighter than paper. Another material with potential in wind turbine and electric car manufacturing. The four electric motors have only 6% energy loss versus a typical 70% loss in normal thermal engines. When you abandon the limiting beliefs of the past and stake out a new path, a new world is possible. This is the mission for Piccard, Borschberg, and the team of engineers, innovators, and partners that make up Solar Impulse — not to carry passengers (or a single pilot) on an airplane, but to convey a message of what is possible.